A number of children have been arrested in Dublin after being caught up in a shocking crackdown by the 26 County state against anti-austerity protests in the capital. More than twenty have been arrested since Monday in a response to ongoing demonstrations against the Dublin government’s new water tax. Campaigners said that people simply can’t afford to pay any more in austerity taxes and charges. Those arrested in recent days include Anti-Austerity Alliance TD Paul Murphy, two councillors and several teenagers as young as 14 years of age. Most have been accused of involvement in a protest in Jobstown, Tallaght, when a vehicle carrying Labour Party leader and deputy Prime Minister Joan Burton was blocked for over two hours by a sit-down protest. Sixteen-year-old Jason Lester was arrested in his bedroom on Tuesday morning when no less than ten garda police turned up at his house at 7am. Gardai put him in a prison cell. He said that he was worried about what his neighbours would think of him being “carted away by gardai” and that people would think he was some sort of “hooligan”. “That experience alone was very distressing. I felt sick in the cell. But he was remarkably defiant about his experience, and vowed to continue protesting against water charges. The Dublin government has insisted that its Ministers not be the target of protests against austerity measures, and Gardai have been ordered to arrest those suspected of organising such protests. Republicans have also been targeted. Eirigi representative Scott Masterson was handcuffed and taken into custody in the first wave of pre-dawn arrests on Monday, before being released later. eirigi chairperson Brian Leeson contrasted the arrests this week with the ‘arrest by arrangement’ approach adopted by the state when it comes to arresting bankers “and other members of the elite”. Defending the right to protest Leeson said the blockading of Joan Burton’s vehicle had been an “entirely justified act of mass peaceful protest”. “Hundreds of citizens, including Scott Masterson, brought their anger in a controlled and measured way directly to a minister who has been responsible for implementing a programme of brutal, anti-community austerity policies,” he said. Republican Sinn Fein said the arrests of the protesters was an “all too familiar experience” for Irish republicans. 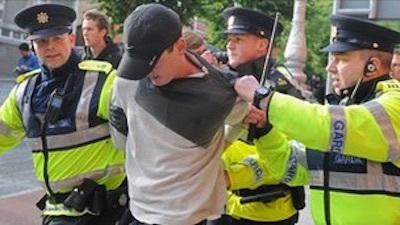 There were angry scenes in the Dail this week as the Socialist party condemned the arrests. Paul Murphy’s microphone was ordered to be turned off as he attempted to raise his own arrest at 7am on Monday. Socialist Party TD, Ruth Coppinger said that the issue is “working class people are not clapping for ministers” when they visit their area. She said that the government want to put working class people “back in their boxes” and are doing this by “rounding up the first born of the people of Jobstown”. Coppinger suggested the Minister had ‘called out the dogs’ against the anti-austerity protestors, bringing condemnation from government benches who claimed that she had rudely referred to the Gardai as “dogs”. Murphy later said the arrests were politically motivated and designed to intimidate Ireland’s anti-water charges movement. He stressed the timing of the arrests, following the election victory of Greece’s leftwing Syriza party, is worth noting. Murphy argued the primary objective was to “criminalise” the anti-water charges protests and quietly quash dissent. Activists pointed out the operation this week is in line with previous attempts to halt the activities of left-wing TDs. In January 2013, socialist TD Clare Daly was arrested for supposed drink driving, although she was well below the legal alcohol limit. Her name was eventually cleared and no charges were brought against her. But the timing of her arrest, which occurred while she was attempting to expose a major corruption scandal in the Gardai, was significant. The arrest was also staged, whereby she was handcuffed and pictures were leaked to the media in an effort to discredit her.